The Border War, as it may someday be known, continues to escalate as hundreds of Central American migrants attempted a mass breach of the US border Sunday afternoon. 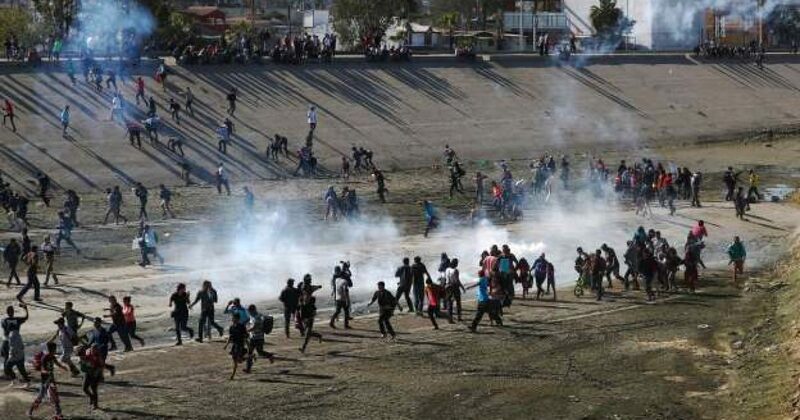 US Border Patrol, backed by US troops, stationed along the border, specifically to deal with this crisis, have responded with tear gas, repelling the attempted invasion for the time being. The good news is that Mexico is beginning to take control of the migrant crisis, understanding that if the United States refuses entry of the migrants, the Central American hordes automatically become Mexico’s problem. Thus, they are doing more to keep the migrants from entering their country from Guatemala. “Mexico’s Interior Ministry said Sunday the country has sent 11,000 Central Americans back to their countries of origin since Oct. 19,” according to MSN. “It said that 1,906 of them were members of the recent caravans. President Trump’s persistence and staying the course has clearly discouraged members of the caravan and forced Mexico to take a more active role in preventing the caravans from reaching the US border. I know that's all fine and well for a liberal weenie who can't see past the end of his nose, but we cannot take care of the entire world. It is our entitlement mentality that has brought them here. No more! Enough! These people need to go home and take their own countries back. They are not "stranded." They walked there. They can walk their asses back! The United States is not Santa Claus. Our young soldiers have paid for our freedom and prosperity with their blood. These losers need to go home and take their countries back! What! What kind of moron are you? We are repelling an invasion. You think Mexico has any rights, sovereign or otherwise, to insist that these parasites be allowed to invade the United States? Really? Your question is so stupid, at first I thought it was rhetorical. Too much stupidity to respond to in 280 characters. So, you are actually stupid enough to believe that invading a country illegally warrants asylum? Asylum is not a right and those who enter the country illegally are not eligible. They have been offered asylum in Mexico but refused it. I guess Mexican welfare doesn't pay enough. I do, since the alternative is bullets.